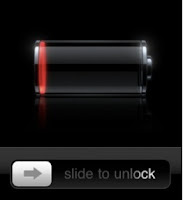 The new iPhone 4S may be the best iPhone ever but... unfortunately it has also been in the news due to undesirable issues: such as its poor battery life. I was just one of the many people that noticed a drastically reduced battery life going from my previous iPhone 4 to the new 4S... and wasn't very happy about it. I was used to getting a full day of averagy/intensive use out of my iPhone... and with the new 4S, I couldn't even get to the end of the afternoon without reaching the critical red stage (below 20%). Sure, I have "everything" enabled: 3G, location services, bluetooth... and I planned on keeping it that way. I also tried some of the tips: disabling the location services for the ads, timezone adjustment, etc. But it made no difference at all. So, a few days back I decided to go old school and simply perform a complete discharge/charge cycle - also called "battery recalibration" - as it allows the charging/monitoring circuits to better measure the battery level. I noticed something might be off, as i quickly got to the 20% mark... and to the 10%... but the iPhone 4S just kept going and going... one hour... two hours... and so on... until a few hours later - at last - the iPhone 4S finally shut itself off. Meaning... the last 20% took almost as much time to deplete as the previous "80%". I left my iPhone 4S charging overnight, and the next day my new iPhone 4S discharge rate was finally similar to what I was used to on my iPhone 4. Going through the day without a hitch. Now, a few days later, the iPhone 4S keeps behaving just as I would expect - and no longer showing me low battery warnings in the afternoon. Considering it won't cost you anything to try it: I strongly suggest you do the same if you're facing the same abnormal "low battery" warning. It might simply be just a erroneous battery level measurement!